A few days ago, I came across a video by Swish on Facebook. It looks like a guy about to propose, scenes like this excites me so I watched until the end and surprisingly the video has a twist at the ending. No, I wont spill the beans and I'll let you watch it for yourself. Isn't it funny? All along I thought it's about to get romantic, haha! Even though the video didn't turn out to be the way most people expect it to be, but the video sure taught us lesson. A lesson on how to always stay confident and prepared by highlighting the importance of having fresh breath even in an instant which is now possible with just 1 #superpump of Swish Breath Spray! Lucky me I received some for me to try, thanks Unilab! Well, we all know that brushing our teeth is part of our everyday hygiene it gives us fresh breath. But as much as we want to maintain a long lasting fresh breath, unfortunately we can't. The moment we eat, the smell of these foods invade our mouth so when we speak we might be breathing out the smell of garlic, onion or whichever food we ate. Yikes! I've been in this kind of situation several times already because blogging and my job requires me to attend events, meet and socialize with different people. However, after eating and with few sips of drinks I tend to lose my confidence and avoid conversations making me lose a lot of opportunities. Only because I'm conscious with what my breath would smell like. How I wish I can brush my teeth or gargle with mouth wash but there's just no time! This is also the same thing when I attend PTA meeting at my kids' school. Sometimes I bring candies with me but it's not enough it doesn't kill the bacteria that causes foul breath and it makes me prone to tooth decay too. 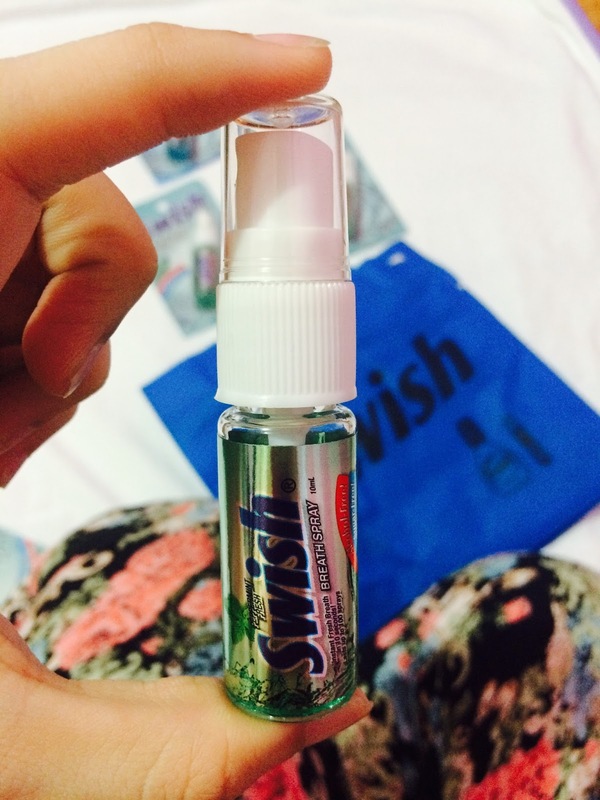 That's why I'm so glad when I found out about this Swish Breath Spray, indeed it's a life saver! It provides instant fresh breath in just 10 seconds. Perfect when you're on the go. It comes in convenient 10ml bottles, very handy. It kills bad breath-causing bacteria so it doesn’t just mask odor. It comes in 2 flavors to choose from: Arctic Chill and Peppermint Fresh. It's sugar-free- fends off cavities, no more tooth decay. It's alcohol free- no sting. It's available in Mercury Drug, Watsons, South Star, Robinsons, Puregold, Shopwise and other selected drugstores and/or supermarkets nationwide. It's made by Unilab – a trusted name! 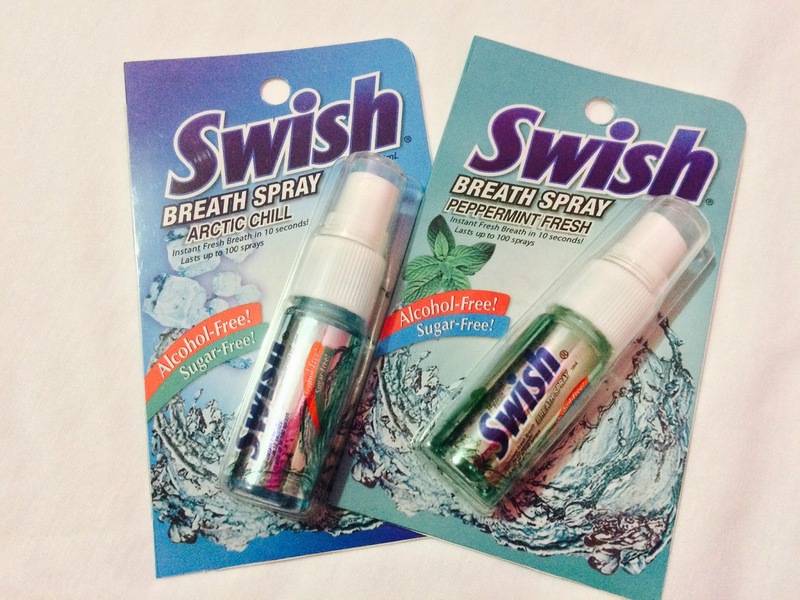 So from now on, this Swish Breath Spray is a definite must have item in my bag. I'm never leaving the house without it! If you have similar experience like mine, it's time to save yourself from any further embarrassment. You don't have to be held captive by foul smelling breath because instant fresh breath can be achieved. 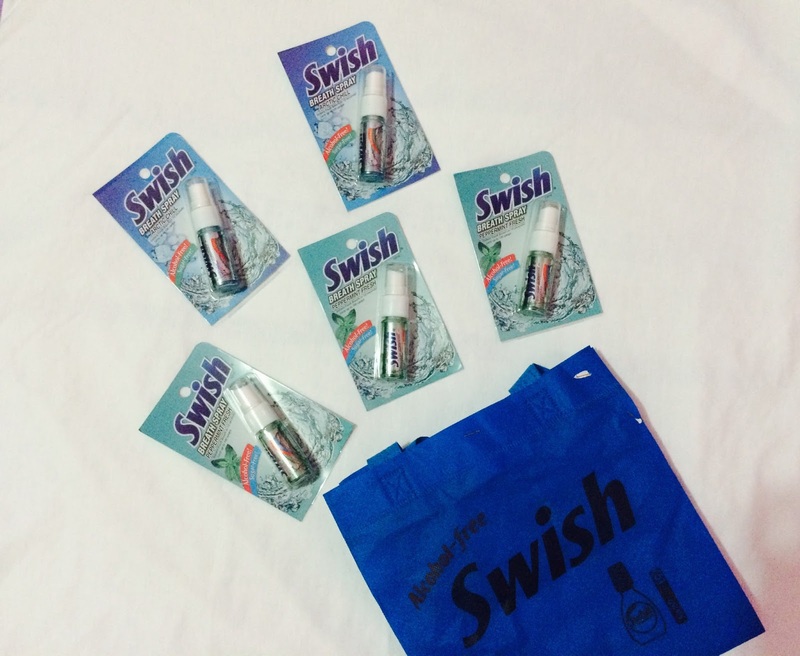 Get your confidence back in 3 easy steps, 1. grab your Swish Breath Spray, 2. #superpump and 3. #SayItWithSwish! 7 years ago when I was 7 months pregnant with our eldest, I got really sick. My OB's diagnosis was UTI so she prescribed medicines and sent me home to rest. Two days after, I still wasn't feeling any better in fact I was feeling even more sick, severe headache, fever was still there, my cough and colds was giving me a hard time breathing and I was feeling really weak. And that's when we decided to rush to the emergency room where I was admitted right away. We were all worried especially for the baby inside me, because if I don't get better I might give birth prematurely. A machine was attached to me to closely monitor my baby. Several laboratory tests were also done until we found out the culprit. My IgM test came back positive for dengue fever! It was a scary news, but I was relieved to learn that it wasn't the hemorrhagic fever which is considered as the severe one. We stayed for a couple more days in the hospital until I was feeling all better. I just then visited my OB frequently to monitor my baby. Thank God everything went well and I was able to deliver my baby healthy and full term. It was my first personal and scary encounter with dengue, I can't imagine the pain and fear I've been through. 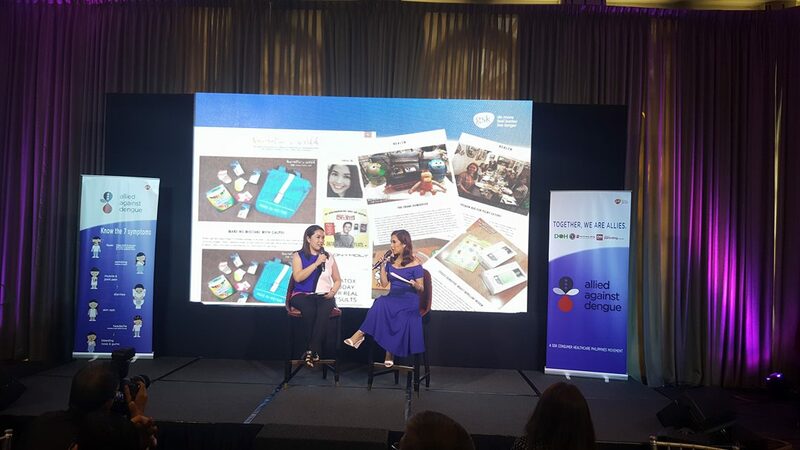 Despite being a Nurse who is knowledgeable about the disease and was able to care for dengue patients before, experiencing dengue personally was a totally different thing. I am hoping that no one else in my family gets to experience it too so I'm doing my best in order to prevent it. 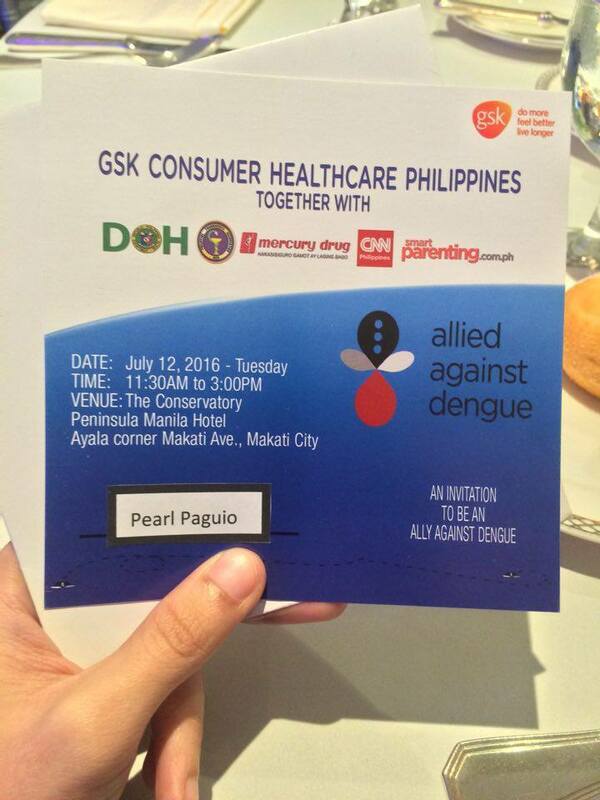 That is why I'm glad that I was invited to become an Ally against dengue and got to attend the launching of the Allied Against Dengue Movement last July 12, 2016. DOH Undersecretary Dr. Enrique Tayag, Philippine Pediatric Society Vice President Dra. 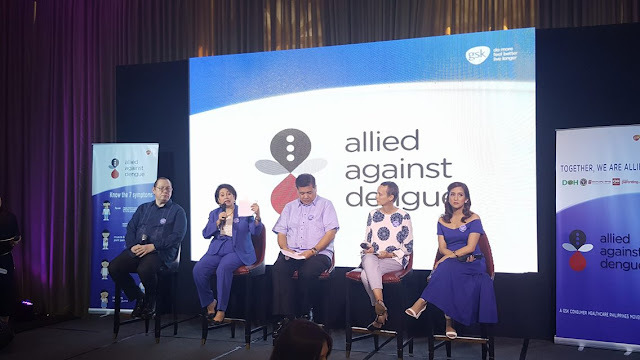 Salvacion Gatchalian, DOH Disease Prevention and Control Bureau Director Dr. Lyndon Lee Suy, GlaxoSmithKline General Manager Heather Pelier, and Calpol mom Jolina Magdangal-Escueta. The Allied Against Dengue Movement was founded by GlaxoSmithKline Consumer Healthcare Philippines Inc. (GSKCH), united with Department of Health (DOH), Philippine Pharmacist Association Inc. (PPHA), Mercury Drug Corporation (MDC), Smartparenting.com.ph and CNN Philippines to create a non-profit open platform with the aim to empower healthcare providers, organizations and communities; and reduce the impact of dengue on the nation in a holistic manner from prevention and control to management. Dengue infection is prevalent in the world and Southeast Asia is the Epicenter of dengue mosquito breeding due to its tropical climate. Here in the Philippines, the disease outbreak is spreading to more areas and impacting more lives. In 2015 there were 200, 415 reported dengue fever cases, a 60% increase over 2014 which had 121,000 cases. This year, the incidence rate even shot higher with cases escalating 33% in the first quarter compared to the same quarter last year. Education and recruitment of at least 1000 Allies Against Dengue through employee engagement, online and on-ground activation. Through this Allied Against Dengue Movement I learned more about this dreaded disease and as a Proud Ally against dengue I pledged to do my part and share with you this learning. 1. What causes Dengue Fever? Dengue fever is a virus infection caused by the dengue virus which is acquired through a bite of an infected female Aedes Aegypti or the yellow fever mosquito. 2. What are the Characteristics of the Aedes Aegypti? Day biters, with biting peaks 2 hours after sunrise and 2 hours before sunset. 3. How many strains of Dengue virus are there? There are 4 Strains of the Dengue Virus and you only get immunity from the particular virus you got infected with. This means you are still susceptible to acquire dengue fever from the other 3 dengue viruses. 4. How can we prevent Dengue? Search and destroy mosquito breeding sites. Self protection measures like choosing repellents or using mosquito nets during daytime. Say NO to indiscriminate fogging and YES during outbreak only. Clean your house everyday paying attention on the gutters and spaces/holes that can accumulate stagnant water. Cover water storage and drums. 5. What re the symptoms of Dengue? 6. What can we do at home? There is no medicine or antibiotic that can treat dengue, only symptom management. For fever avoid giving Aspirin or Ibuprofen or NSAIDS as these may aggravate gastritis of bleeding in dengue fever. World Health Organization recommends Paracetamol only like Calpol which is manufactured by GlaxoSmithKline Consumer Healthcare Philippines Inc.
7. What are the warning signs of Dengue? 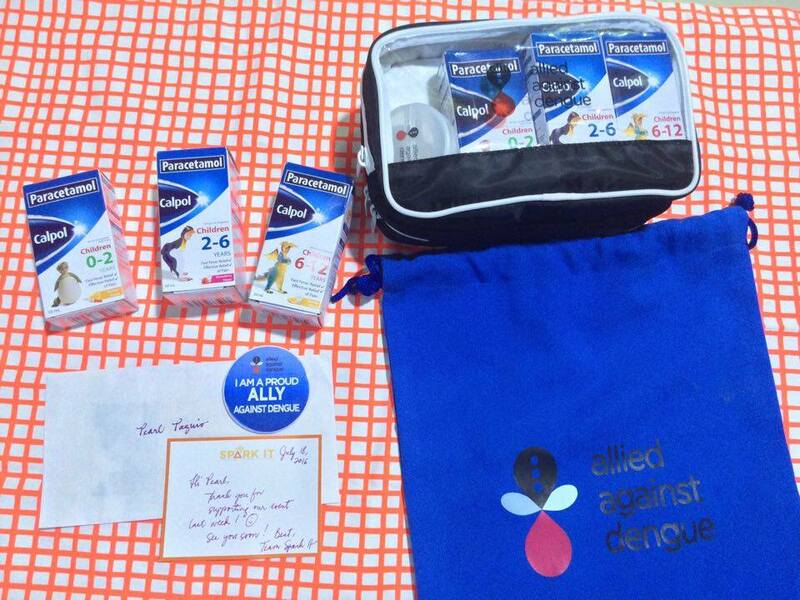 Thank you GSK and #AlliedAgainstDengue for inviting me to be part of this movement. Now that we are equipped with the right information we can totally make a big difference and save not just ourselves but the people around us. I invite everyone to become Proud Allies Against Dengue, share this information to everyone you know and together lets defeat Dengue! Here in the Philippines, anything South Korean has become a big hit! Admit it or not, but we sing along to K-pop music even without understanding the lyrics right? Haha. We religiously tune in to Koreanovela's, good thing they are being aired in local channels and are dubbed in Tagalog. Kimchi, Bibimbap? name it, Korean food are yum yum! I'm sure I am speaking on behalf of the majority of Filipinas when I say that Korean's spotless and flawlessly beautiful skin are to die for, that's why most of us patronize their skincare and cosmetic products, don't we? And don't forget about their charming and trendy fashion style! I can go on and on talking about this Korean craze but here's three words that will surely get you hyped; Mall Of Korea! It is a fashion retail haven for everyone who loves anything Korean and the good news is, they finally opened their first ever branch here in the Philippines! No need to shop online, with the constant worry of not getting the right product or the right size, the waiting game before it gets to your doorstep and of course the amount of shipping you have to shell out. Hooray! Mall of Korea held their soft opening last July 14, 2016 and I was among the lucky ones who got the first dibs on what they have to offer. We also got to meet the person behind Mall Of Korea, Nina Lee who is a Korean designer since 1975. She was also the Director of Korea Business Association from 1987 until 1992. 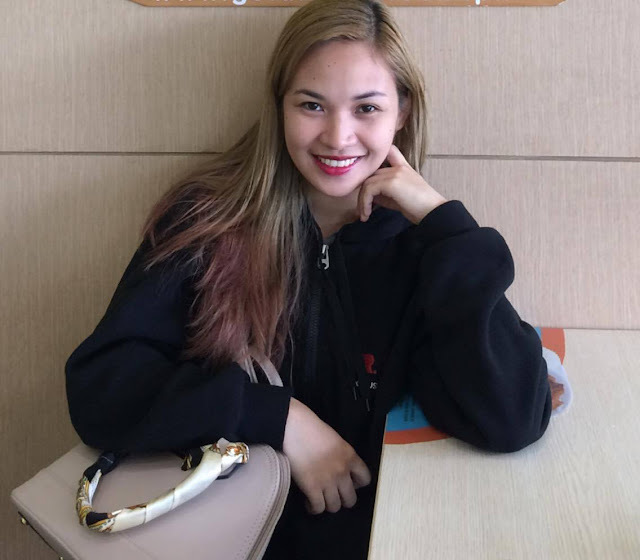 Nina Lee opened her first branch in Myeongdong, Korea. She now has more than 60 shops and now she proudly brings authentic Korean Shopping experience here in the Philippines! It wouldn't be fun without these 2, Eihdra and Lhyzie! It's been a while since we last saw each other. Mall of Korea has everything for everyone from stylish clothes, accessories, cosmetics (soon! as they are still awaiting approval from BFAD) and other fabulously interesting finds. It carries all-original and branded apparels, collection of designer products from Nina Lee, Luisa Spagnoli and many more! The prices are least expensive compared to the leading malls since the products are directly imported from Korea. For the budget conscious people they also have the SALE Section but don't worry because the quality are all excellent! Whether it's casual wear, everyday wear, party dress, name it you'll find them all here. The place is also spacious enough so you'll definitely enjoy shopping with your friends. They also have Disney apparels for kids! Guys need not to worry as there's also something for them too! Pretty "Mommy and Me" set for the moms and daughters. This is my first Authentic Korean shopping experience and probably one of my best shopping experience ever. 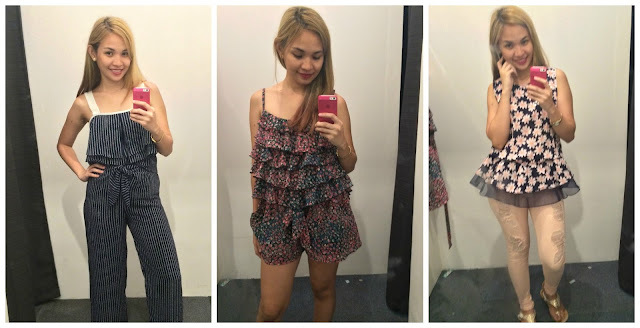 I went crazy over the adorable and trendy pieces. I spent a good amount of time shopping and totally forgot about my dysmenorrhea and my aching legs. Lol! I even went in the fitting room with my two hands full of clothes. If only I can take them all home with me! Haha. Here are some of the pieces I was able to try on. I really like the first one, too bad the top was kind of loose on me. The jump-short on the middle photo is so nice and comfy, I'll be back one day and get it. I bought the pink skinny pants and the flowery dress-like top on the third photo and some other pieces which I wasn't able to take photos anymore. Indeed it was a SEOULfully delightful shopping experience, I can't wait till my next visit! And, I would also love for you to experience a SEOULfully Authentic Shopping spree at the first ever Mall of Korea here in the country so I'm giving away 2 MOK Cash Cards. Each Cash Cards are in 300 denomination only so 1 winner will get a chance to win 900 and 1 winner of 600 MOK Cash Card. To enter the giveaway please follow the easy steps on the rafflecopter below. Note: Please follow mandatory steps to make your entries valid. This giveaway is open to all participants nationwide as long as you can claim your prize personally at the Mall of Korea located at the 2nd Floor of Metrowalk Complex, Ortigas Pasig City. Store is open from 10AM until 11PM daily. UPDATE: Congratulations to Emcel F. - 900 MOK Cash Card and Liberty F. - 600 MOK Cash Card. 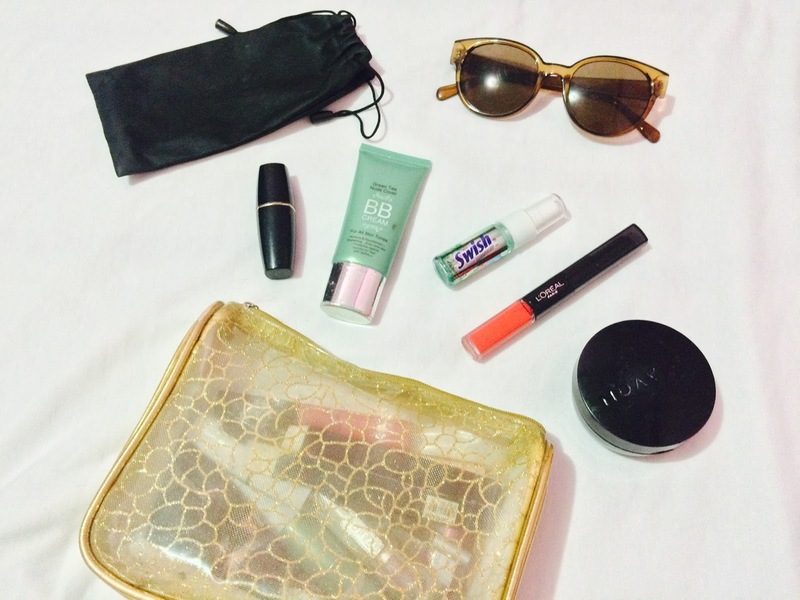 Please email me your Complete name, address and contact number at pearlipaguio@gmail.com for you to claim your prize! There's nothing I like more than trying out new things! For the past years and months, I've lived a pretty mundane life as a full time mom. 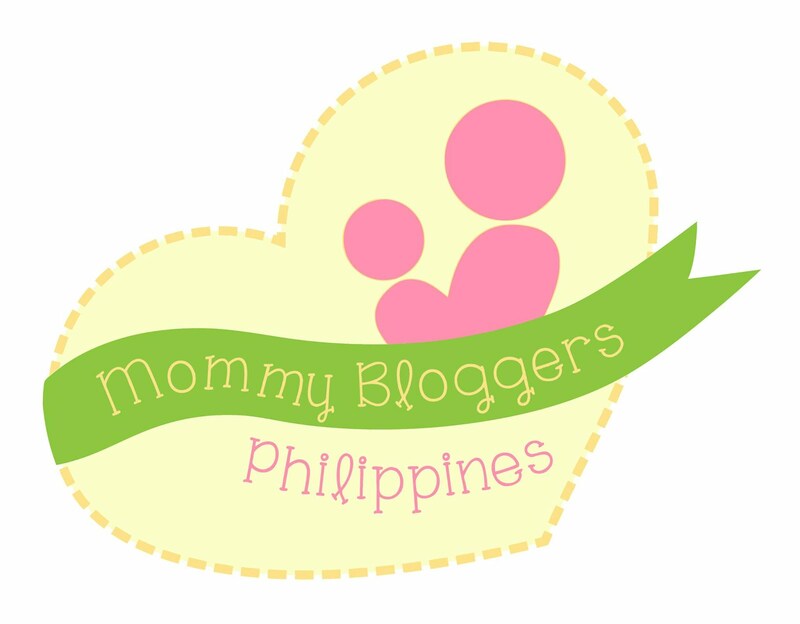 I'm not making any excuse here, I love being a mom but motherhood perhaps is one of the reasons why I've fallen off the bandwagon. However, as cliche as it may sound I realized that being a mom should be the reason, and not an excuse for me not to feel good and look good. Remember the adage "Happy Wife. Happy Life"? It's true, when mommy/wife is happy everyone in the family benefits from it, right mommies? So, aiming to break the monotony, I've started working from home. To balance it out, I do blogging as a hobby and attend blog events for my social life where I get to meet people from all walks of life and through blogging I get to discover and try out new things, which is really fun! 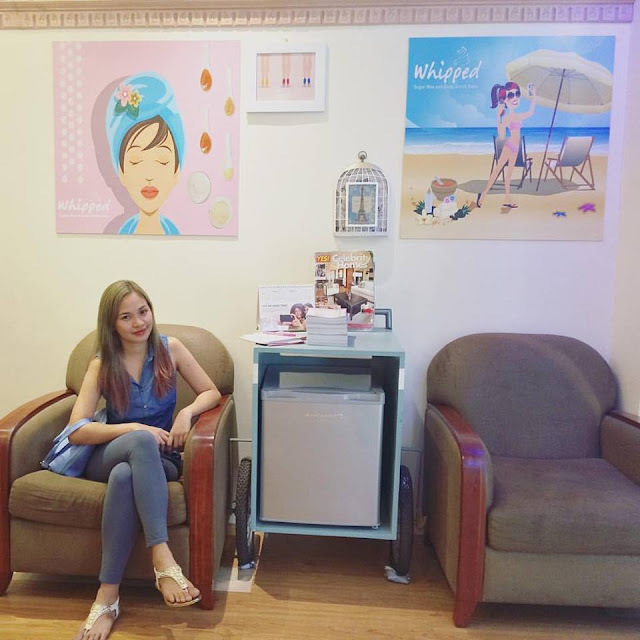 In line with this, few weeks ago I discovered Whipped Sugar Waxing and Scrub Salon and they dared me to change my usual hair removal habit into a sweet, fun and new concept; Sugaring or Sugar Waxing! 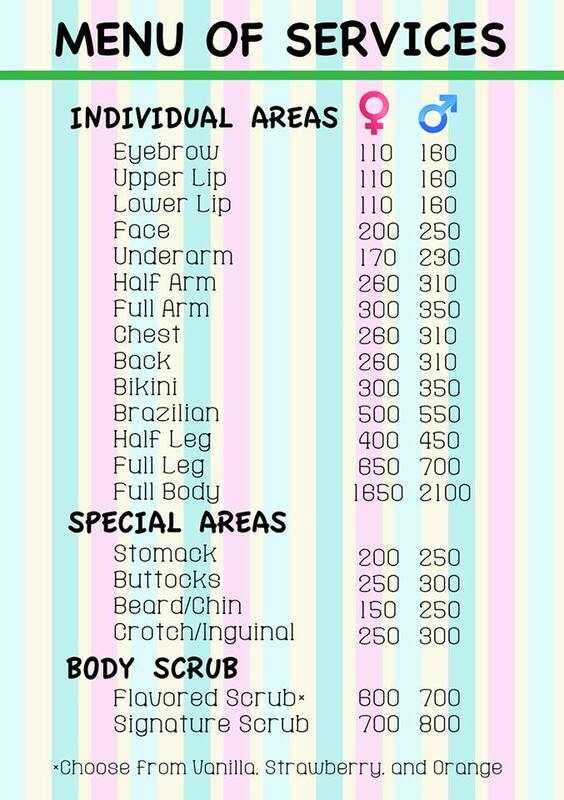 I get rid of unwanted hair through shaving but I also tried Hot Waxing once before so Sugar Waxing really sounds new and interesting! So I excitedly accepted the dare, scheduled an appointment and went to their branch at Alabang Town Center. They share store with Kitchenails. Upon seeing their salon, I became more excited! 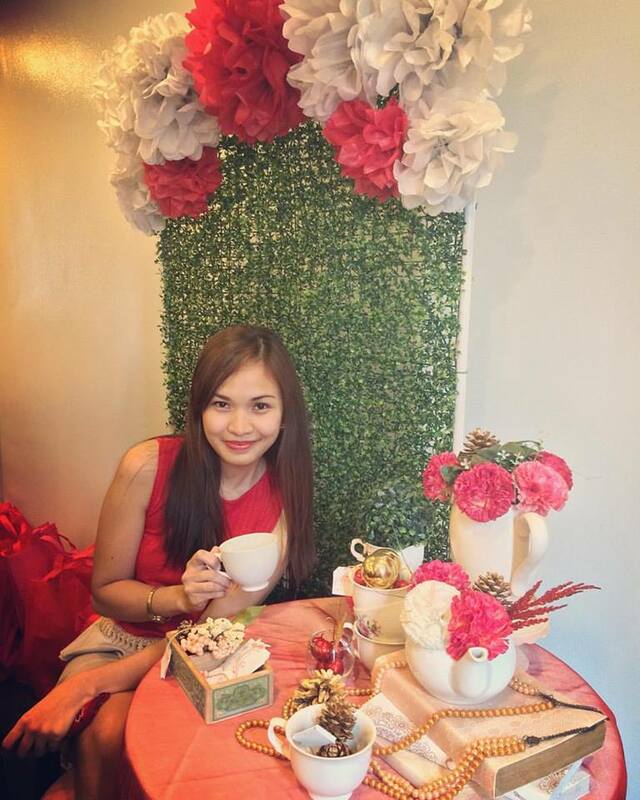 It looks looks like a candy store, with the pastel colors and girly theme I thought to myself, the owner Ms. Bing Fabi, must be very sweet and chic herself! The staffs were also nice and accommodating, I was then taken into 1 of their 3 waxing room, it was actually 4 rooms but I guess they used the other one as a storage room. Each room was spacious enough, it has 1 single bed in it and a side table with some essentials, like alcohols, tissues and gloves. 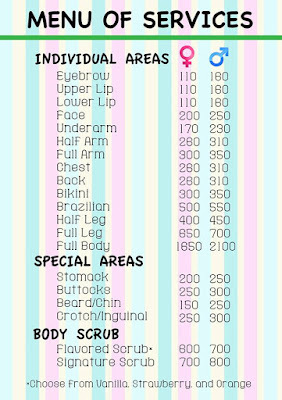 After asking which service I'll avail, ate Alyssa my sugaring technician left me in the room to prepare the sugar wax. What is Sugar Wax made of? Sugar wax is made of all natural food-grade ingredients mainly sugar, lemon juice and water. Sounds yummy right? Well aside from that, it is definitely a wise and green choice, it's safe for you and for the environment. Hot wax on the other hand are also made of natural ingredients like essential oils but also contains chemicals and preservatives that could be irritating especially to those who have sensitive skin. 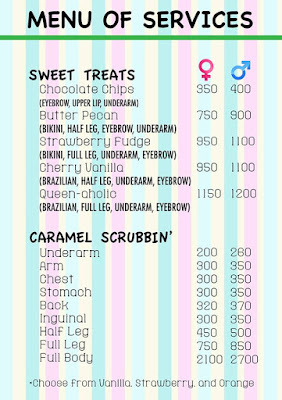 So I availed the brow and underarm sugaring. They started with brows which doesn't need shaping anymore since I already had it tattooed before. It only needs grooming, you see I honestly don't know anything with brows, I don't know how to apply make up on it, I don't pluck it, I only have it shaved or threaded in salons. It's my first time to have it sugar waxed and surprisingly, it's least painful compared to threading, and probably plucking. The procedure for both my brows lasted for about 15 minutes only and the remaining small hairs were just plucked with tweezers. Next was my underarm. Ate Alyssa noticed that the hair on my pits was thick and coarse she knew I was shaving it. I also have chicken skin which she said is the other negative effect of shaving. I also don't have a light/white underarm, which is probably caused by using different kinds of deodorant and maybe caused by pregnancy that's why I was happy when she said that sugaring has a lightening effect. (crossing my fingers on that lol) The underarm sugaring doesn't hurt at all and it lasted around 15 minutes as well. Afterwards she advised me not to wet my brows and underarm for the next 4 hours. I love it! Aside from the fact that it's made of all natural food-grade ingredients, sugaring is more gentle as it only attaches to the dead skin cells. 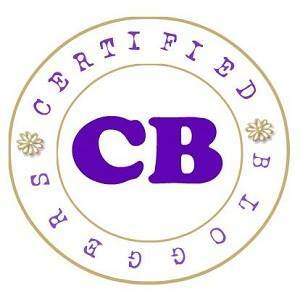 Sugaring is also applied cold or at room temperature so its less likely to cause skin burning. It's also not sticky and if there are any wax residue left, it can easily be removed with water as it is water soluble. Most of all it's not really painful and although it might cause a mild redness or blister it subsides in no time. I also give my sugarist a thumbs up as she was very nice and conversational. Will I come back again? Surely I will and I'm excited to try out their other services especially the sweet treats! Ladies and gents too, if you want to experience the new craze in hair removal and body scrubbing, check out Whipped Sugar Waxing and Scrub Salon and dare to get Whipped! 3. 2nd Floor, Eight Forbes Town Center. She carried me in her womb for 9 months. Brought me into this world, cared and nurtured me during my early years. She's my teacher, my first best friend, my number one fan and my personal nurse; these are just among the many roles she does as my mother. I was the youngest among four siblings, thus I was very close with my mom. I was inseparable from her. However as I grew up, the special bond and attachment I had with my mom changed little by little. Growing up, I would seek for independence and freedom and this would cause conflict between us. I have committed a lot of mistakes, even terrible ones but I never got judged by my mom with my poor judgement. But yes my mom would scold me. She could go on and on talking about what I did which is kind of irritating (if you know what I mean lol) but then again she only hopes to instil lessons on me and help me make better judgements in the future. Mothers are amazing right? And now that I’m already a mom, I understand and appreciate my mom even more. All the constant nagging and the persistence was all for me, because indeed mothers only want what’s best for their children. Every mother does their best to make this world a better place to live in for all their children, but would it be the same if we are working with mom in the same workplace? I know this isn’t a common situation as most companies don’t allow mother-child, girlfriend-boyfriend or any relationships in the workplace just like in the previous company I worked for. But I am entertained when I learned that there are still companies who allow this. And it just suddenly crossed my mind, what’s it like working with mom? Well, I really couldn’t tell since I haven’t experienced it personally but I have been thinking about this because in my previous work, I have colleagues who are mothers too and I’ve seen how motherly they are to everyone. Also relating it to how my mom is, I can already imagine how it’s going to be like. So I came up with this list. 1. You got a piece of “home” at work- Admit it or not but not everyone really like their job/work, sometimes it’s just the people in the workplace that makes them enjoy going to work. Now imagine having your mom in the office, it’s like having a piece of home and comfort in the workplace. 2. You have a cheerleader- You know when situation at the workplace gets challenging and you feel like giving up? Well, working with mom is a totally different thing. She’ll be there cheering for you. Go go go! Y-O-U-C-A-N-D-O-I-T-! 3. Free lunch, everyday!- Remember when you spent almost your entire salary because you reached your credit cards limit? Or running out of budget perhaps? Worry no more, because working with mom means free lunch and yes it can be every single day! 4. Free ride to and from work- Got no wheels? No cash for public transport? Here comes mom to the rescue! 5. Save more - So you get free lunch and free rides. You won’t be spending as much as you use to. 6. Stronger bond with mom- Regardless of living with your mom in the same house or not, working with mom in the same workplace will surely strengthen your bond not just as mother and grown child but as friends too! Working with mom could both be a blessing and sometimes a challenge especially when personal issues get their way into the workplace. But every problem has a solution. Everything will eventually be alright. And with all the positive side of working with mom in the same workplace, I’m sure the negative side will be outweighed. How’d you like the idea of working with your mom? Are you ready to enjoy all its perks and surpass its challenges? Then on your next job hunting, tag along your mom and make sure to check out BPO Career Hub you and your mom are most welcome there! Cool isn’t it? One of the things many hard-driving professionals know that sweating in order to detoxify is what they have to do daily in order to de-stress and remain healthy. Burning calories to reduce the amount of fat in their body is another. Unfortunately, many of them find it hard to squeeze in a trip to the gym or a morning walk around the block into their busy schedule. 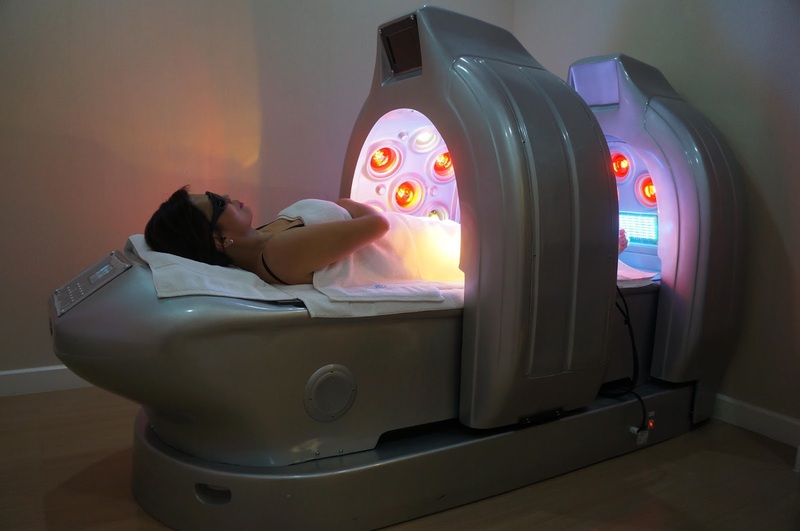 For weekend warriors needing to break out some serious sweat, one convenient, comfortable alternative – which can also allow them 30 minutes of precious shut-eye time – is the Thermogenic treatment in SvelT’i’s beauty and wellness center in Timog Avenue, Quezon City. The experience is something similar to being in a steam room, with three crucial differences: the experience is private and individual, unlike the more socialized steam room which is designed to hold several people; and the patient can choose to relax and/or sleep while the machine steadily softens fats and makes them leave as sweat out through skin pores. Sweat and burn calories while you sleep? How is it possible? The Thermogenic machine emits into the patient’s body Far Infrared Rays or invisible waves of light that have the ability to penetrate our tissues, muscles, and bones. It can warm our body without heating the air. Unlike Ultraviolet light, Far Infrared Rays do not cause sunburn; nor do they damage the skin. With the absorption of the FIR deep into the cells, the body generates heat and stimulates the increase in energy consumption which triggers a boost in metabolic process. This will result to the breaking down of fat cells, cellulite, waste, and other forms of toxic substances in the body. Thermogenic can burn 600-800 kcal per treatment. Visceral fat can also indicate the amount of fat that may be wrapped around some of the patient’s physiological organs; the higher the amount of visceral fat, the greater the risk the patient has in developing medical conditions like hypertension. “The metabolic rate also indicates the speed or slowness by which the patient burns calories in her body, even if you are just in your thirties, but your metabolic rate is like that of a 50-year- old, thenchances are you will tire easily and not produce the amount of energy you need for your daily activities. On the other hand, you may be 50 years old, but your metabolic rate is that of a twenty something, then chances are you have a lot of physical energy which makes you more active than people half your age.” said Dra. Lalaine Salazar, SvelT’i’s Medical Director. Thermogenic also speeds up a patient’s metabolic rate, which makes it a faster way to jumpstart your process in fat reduction and weight loss if you had been physically inactive for weeks or months. The first session will induce a significant amount of sweat; eight to ten sessions are recommended to see the results. Thermogenic also improves the patient’s blood circulation, cellular oxygenation, and skin condition. It promotes relaxation and better sleep during her rest hours, while energizing your body during the day. Sessions are likewise best taken any time of the day. To know more about SvelT’i’s Thermogenic, please inquire at (02)332-7546 / 09188-SVELTI (783584) or visit the clinic at 5F South Insula Condominium #61 Timog Avenue, Quezon City from Mondays to Fridays from 9am-6pm and Saturdays from 8am-1pm. You may also visit SvelT’i FB page at www.facebook.com/sveltiph and IG account @SVELTI_PH. "Traveling is the only thing you buy that makes you richer" I once read this quote somewhere online and it made me wonder. You spend a great amount of money just to travel. Airfare and transportation alone is already equivalent to a month's worth of grocery. You also have to shell out thousands for accommodation and other expenses. So how does traveling make you richer? I found the answer when I started to travel. I don't travel a lot, I still can count with my fingers the times I have traveled and mostly my travels are from Manila to our province. Since I got married I already lived here in Manila with my own family, away from my parents. So aside from keeping in touch with my parents thru social media, I once a year see to it that I travel to our province with my own family. We visit my parents and relatives and at the same time a chance for us to unwind and tour my kids to my hometown and surrounding places. Yes we spend money but in return we have created a special bond as family and lots of memories that we can treasure for a lifetime and I guess that what makes us richer! Bank of the Philippine Islands (BPI) understands everyone's reasons for travelling, thus BPI Card allows everyone to enjoy travel deals and free trips only with your BPI Card at the 5th Travel Madness Expo! Marie Josephine Ocampo- BPI SVP (Payments and Remittance), Dave Lim- Philippine Airlines SVP (Commercial Group), Chicoy Enerio- COO Tourism (Promotions Board), Ma. 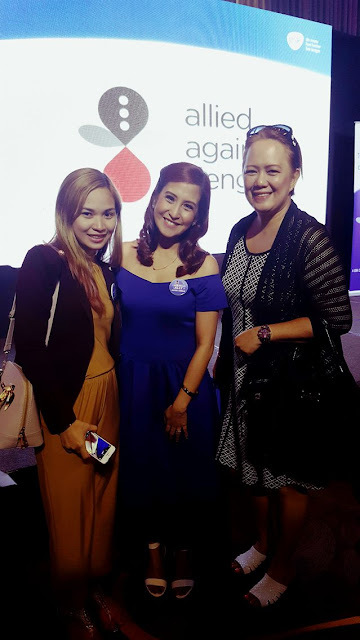 Paz Alberto- VP Travel Innovators Inc., Wanda Corazon Tulfo-Teo, USec. 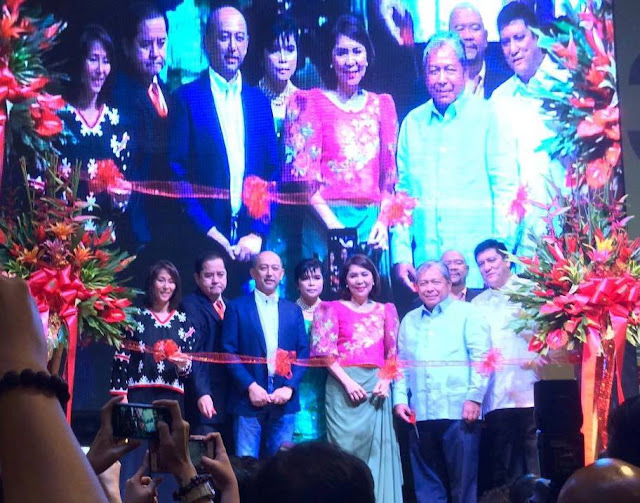 Department of Tourism, Jaime Bautista, PAL President and COO, Raymond Michael Tee- President Travel Innovators Inc. , Lorenzo Formoso- COO Duty Free Philippines formally opens the program last July 8, 2016 at the SMX Convention Center. On top of the discounted travel deals, BPI cardholders will enjoy exclusive offers that include a chance to win in the daily raffle promo where 15 trips from Mabuhay Miles will be given away. Five daily winners during the 3-day event will be chosen for a chance to fly to a local destination, Hong Kong, Singapore or Japan! BPI Card holders purchasing a ticket from Philippine Airlines will earn 1 raffle entry for every PhP5,000 spend. From July 7 to 10 cardholders are also entitled to BPI Cards Exclusive Offers that includes a free Samsonite Passport Holder for every P12,000 spend at Samsonite. AFree Packing Cube Set for every purchase of Delsey luggage at The Travel Club and 10% Discount on Sentosa’s Play 3 Day Pass. Travelling has never been this rewarding. So if you love to or aspire to travel more, don’t miss this opportunity! 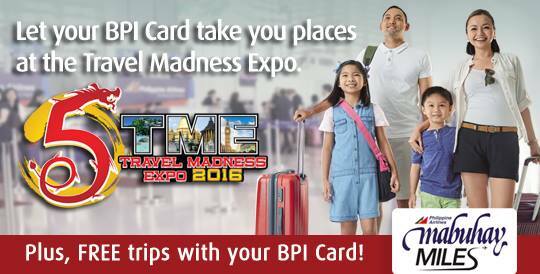 Visit the 5thTravel Madness Expo and use your BPI Card to make your dream travel a reality! On my previous post, I talked about how Barbie empowers little ladies to follow their dreams whatever they may be, and for the adults to encourage them on their journey. Inspired by Barbie's You Can Be Anything Campaign, I have finally listened to the inner voice and my long time dream of reinventing my looks and becoming blonde. Lol! This is the my hairs' transition through the years. Let me share with you a short history about my hair. Back in the days, I have wavy black hair. Then during College, I grew tired of my frizzy wavy hair thus I had it rebonded but I kept the color. It never crossed my mind back then to have my hair color altered. Came 2014 when I had a change of heart, I decided to be a cool mom lol. So when I went to have my hair rebonded I also decided to have it colored as well. I really liked the ash blonde hair color but the stylist informed me that we wont be able to achieve it since my hair was black. I agreed and was actually kind of relieved since I think I wasn't brave enough to make a drastic change that moment. 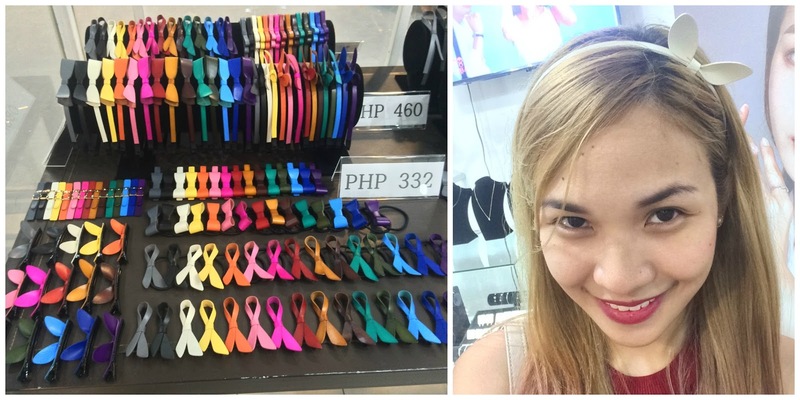 More than a year after, around October 2015 I again had my hair rebonded and colored. Still opted for ash blonde even though I know it wont turn out that way. 5 months after I had a Brazilian blowout and hair color retouch again with ash blonde, I really have a thing with ash blonde lol. #TheManeEvent was held for 2 days. I together with Lhyzie was part of the 1st day, where I also got meet Melissa Ungco of http://www.caramelyyy.com/ (first photo) who is also from Las Pinas. Then last month, I got an invite to The Mane Event, thank you Sir Jhong Medina! #TheManeEvent was a hair color service and professional hair care treatment event for Bloggers in collaboration between Going Straight Salon and Nouvelle. It was very timely because I was also thinking about having my hair colored again. Prior to the event, I spent days thinking about what hair color to get. I can't decide! And then, #TheManeEvent happened, it was held at Going Straight Salon in SM North Edsa. But before we started with our hair makeover, we were first briefed about the event. So let's go ahead and get to know more about Going Straight Salon and Nouvelle. 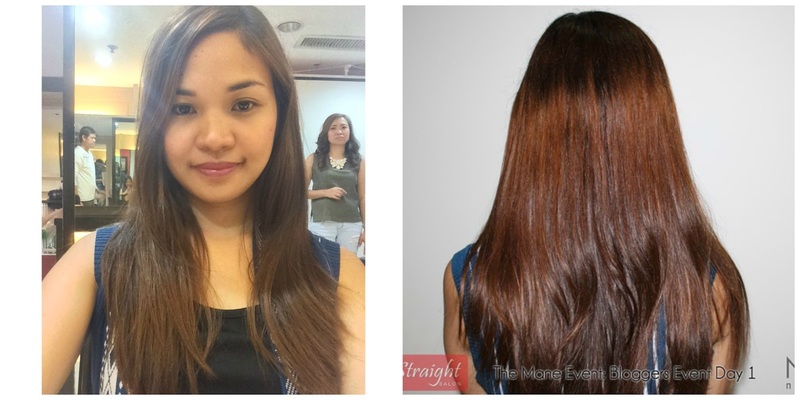 Going Straight Salon is founded in 1988 and is one of the pioneers in hair straightening. They offer the ultimate experiencein beauty care. Their paramount concern is to be known in the industry in terms of service dependability and a leader in innovation techniques for more affordable services. Going Straight aims to keep up with their standards being the pioneer in the industry they also constantly send their stylists to training and for this event, they gathered their top stylist from different branches to style us. Nouvelle is one brand that is being used by Going Straight Salon. Leading player in professional colouring and with thirty years of experience plus the constant search for innovation, Nouvelle is synonymous with style and trend on top of being a guarantee of hair care and attention. Always searching for different, modern, creative looks, Nouvelle is the trendsetter that has created a new young and contemporary generation of colour and style boasting more than 15 product lines. For The Mane Event, they introduced and used their latest products on us; Lively and Eslabondexx. Lively is the new generation professional line for coloring and protecting hair. Its special formula, without ammonia and parabens, does not damage hair and does not irritate the scalp, providing a delicate coloration, suitable for sensitive skin. The color is intense, natural, bright, and provides a perfect coverage of white hair. Lively is not only coloration but also a veritable nourishing treatment that takes care of the hair structure, thanks to the use of active ingredients of natural origin, such as sweet almond oil and lotus flower, known for their soothing, softening, moisturizing and invigorating properties. Eslabondexx is used in combination with Lively or any chemical hair treatment, prevents damage before it can even start, preserving and protecting the hair structure whilst the chemical treatment is acting: in fact, Eslabondexx strengthens the hair structure delivering elasticity, strength, enhanced condition, and preventing it from breaking. Competent stylist and new generation professional line of hair care treatment, what more can I ask for than to get #TheManeEvent started! Ooops I almost forgot, they also showed us models with hairstyle pegs then they let us choose who among the stylist we prefer to style our hair. I chose Ej as I like what she did on her model, blonde with pink highlights, it was similar to what I have in mind. We carried on with the bleaching, not just once but twice. I guess my hair was yellowish after the first bleaching that's why they have to do it again. I like blonde but not yellowish blonde, I like it to be lighter. Again, I was scared that my hair will be damaged, imagine bleaching it two times in just a matter of hours? However they assured me that it wont damage my hair because of the Eslabondexx. Without it, on the second bleaching my hair would have broke already but it didn't, so yey! I really didn't expect that the process would take a while, we started around 12 noon and it was around 2PM or 3PM I guess when we finished with the bleaching and then we started with the coloration. I kept reminding my stylist, Ash blonde but I was surprised when the color he was applying on my hair was dark! I asked him if it's ash blonde and he said yes. So I let him continue, afterwards, he applied the color pink on the bottom part of my hair. He then left it on my hair for few minutes, washed it and then he blow dried my hair. This is what my hair looked like after. I know it isn't Ash blonde. I though to myself, maybe all he heard was "Ash" so I asked him again and he said it will be washed off when I take a shower. I felt a bit dissapointed at first because this is not what I expected, but he assured me that it will be washed off anyway the ash gray color wasn't that bad after all. Then they also gave us Nouvelle Re-styling Serum and Going Straight Shampoo and Conditioner. I just found out though that the shampoo and conditioner is for black hair only and not really suitable for bleached hair. But I like the serum, it's a life save, I use it everyday. I then went home, it just felt weird because people kept staring at my hair, haha! Upon reaching home, my kids were all like "Mommy, what happened to your hair? I would answer them back with a question, "Why, is it not nice? Don't you like it?" and they'll answer "It's nice, we like your hair mommy!" lol! When I asked Jaear what he thinks, he said it looks good however it just looked weird haha. True enough, after several washes the ash gray color got washed away. This is what my hair looked like exactly four days after the event. And, as they passes by I feel like it's getting lighter and lighter. Honestly, I like it because I wanted my hair to be blond anyway. However, the pink bottom part isn't as pink anymore, well I guess it wasn't pink in the first place. My son said it was purplish LOL! And this is my recent photo. Regardless of the color, some people thought that bleaching my hair wasn't a good idea, they felt sorry for my hair. However, I knew about the possible damage bleaching will cause my hair but I willingly embraced it. I'm glad I did, rather than regret about not giving it a shot one day when I look back. Thanks again Nouvelle and Going Straight Salon for the privilege, it was just once a wishful thinking and now here it is! I wouldn't have done it without #TheManeEvent and if I didn't trust the product and the people behind it. I will visit one of your branch soon for my Green Tea Treatment which was included on our take home loot bag! So ladies, cool mommies and daddies if you want to have your hair colored make sure to check out Going Straight Salon, with their 28 years in service, competitive stylist and staffs you're in good hands. Also make sure to ask for Nouvelle's new products Lively and Eslabondexx for a good quality and free of harmful chemical professional line of products that won't go breaking your hair! I once read this quote online and I love it! And luckily, I have two daughters which means, I have two best friends in the making. Hooray! One thing I also love to do is shopping and one Sunday, Jaear and I took Athena shopping for a dress that she can wear at school and special occasions as I also have a waxing appointment at Alabang Town Center (ATC) while Tristan and Brianna was with their Lolo and Lola. After my appointment at the waxing salon, we found ourselves at the Pois Belly and Kids Boutiqe and upon entering Athena gave me a big grin. She was even more excited when I told her to choose whatever she wants. The staffs were kind enough to assist us and grew fond of Athena. Athena acted too shy with the staff so I helped her choose instead. 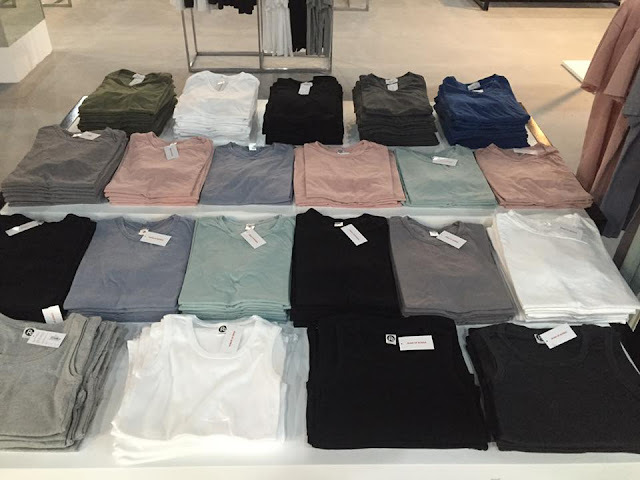 Each apparels has unique and very dainty design. I also like how each are made with good quality cloths. 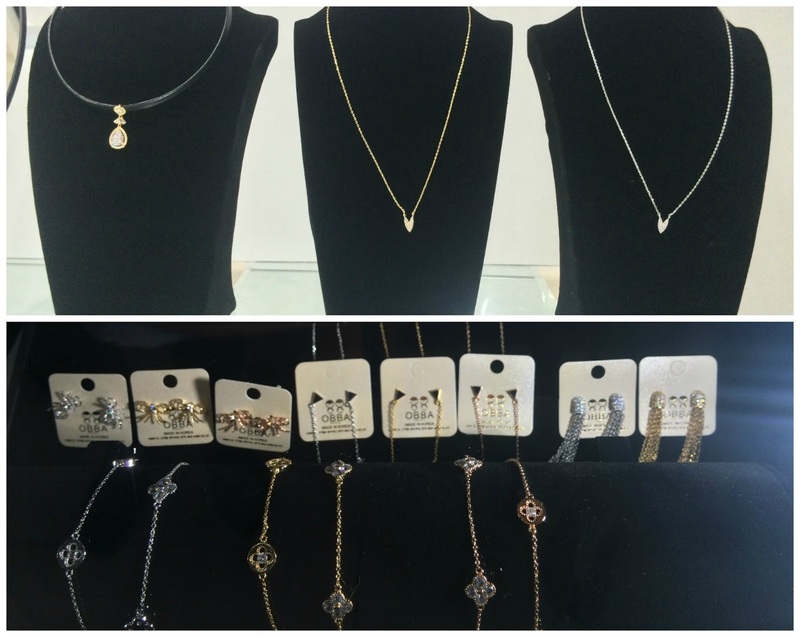 We had a hard time deciding on what to get as there are a lot of adorable pieces to choose from. We ended up with a total of 5 dresses in our hands, then went on to the fitting room to have Athena fit them all. I also asked her to pose so that I can have her photos taken. She was really shy especially when the staffs were watching her so the they just pretended not to look haha! This was her first choice. She was fond of the yellow fur flower ball accent on it. It's nice but was kinda loose and the next small size is too small for her. Sweet candy and it's pink, her favorite color but again was kinda loose. This is beautiful and the old rose color too, perfect for special occasions. This is one of my favorite, so dainty! Agree? This was my first choice. It's simple yet it looks elegant. She can use it at school and for occasions too. She has lots of pink dress already so we thought that it would be nice to get her a different color. Anyway she has a fair complexion, almost any color suits her. The fitting is just right as well. Athena liked it too. Can you guess what we picked? See! I told you, everything is just soo adorable. You can't just pick one! Then I asked her which dress she liked the most, and she couldn't give me a straight answer, I guess she wants to have it all too! In fact, when we went home, Athena excitedly showed her Lola what we got for her. She cried when she saw just 1 dress, she taught we took all 5 dress. Aww! Nevertheless, I'm pretty sure Athena loved hew new dress and that she had fun shopping as much as I did. It was a great mother and daughter bonding and I can't wait to do this more often, next time with Brianna too. 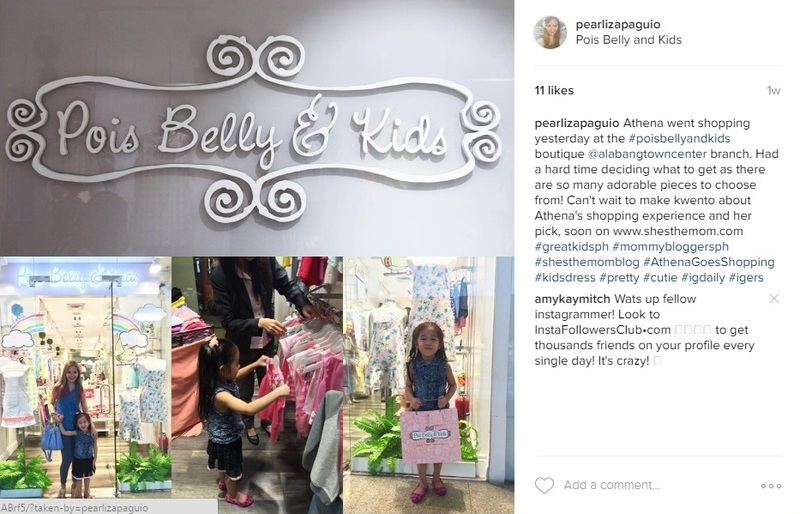 Pois Belly and Kids is not just a boutique for little girls, it's actually a one-stop-shop for Mommies and kids. Great Kids - cute and dainty apparels for kids between 2-10 years old. They also have pretty Mommy-and-Me dresses perfect for twinning moment. Would like to get one of these soon!